Scientists have sounded the death knell for the plug and power lead. 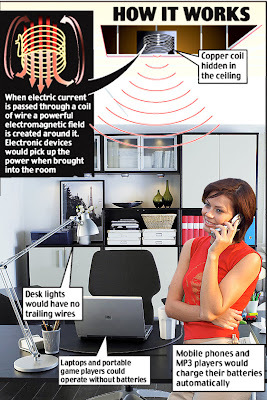 In a breakthrough that sounds like something out of Star Trek, they have discovered a way of 'beaming' power across a room into a light bulb, mobile phone or laptop computer without wires or cables. In the first successful trial of its kind, the team was able to illuminate a 60-watt light bulb 7ft away.The team from Massachusetts Institute of Technology, who call their invention 'WiTricity', believe it could change the way we use electricity and do away with the tangle of cables, plugs and chargers that clutter modern homes. It could also allow the use of laptops and mobile phones without batteries. The inspiration came when the lead researcher, Dr Marin Soljacic, was standing in his kitchen at night staring at his mobile phone. "It was probably the sixth time that month that I was awakened by my cell phone beeping to let me know that I had forgotten to charge it. It occurred to me that it would be so great if the thing took care of its own charging," he said.